The seed of this self-portrait began many years ago when a workshop student in Germany gave me a pink cotton bedsheet with a larger-than-life print of a wide-eyed young woman by the Japanese artist and illustrator Mira Fujita. The image reminded me of an idealized (and more beautiful) version of myself around the time of my wedding—the shape of her face, her curly hair (I had a perm at the time), and the flowers in her hair (I wore a pouf of silk organza flowers on my wedding in lieu of a hat, or god-forbid, a veil). I knew I would make something with this cotton fabric one day, but put it away for over fifteen years, occasionally coming across it when organizing my studio. When Through Our Hands proposed the Portrait exhibition, I rescued the sheet and realized it was time to think about the last three decades as my husband, Craig, and I approached our 30th wedding anniversary. Who was that optimistic youngish (32 years old) woman? Who is she now (at 62)? This lead to the solution of making two works, one collaged directly on the bedsheet mounted to what I call a quilt canvas. The other would be collaged over a print on fabric of the first. Just to make myself even more self-conscious, I thought to record the whole process with a time-lapse video. I set forth, not knowing where this project would lead me or how I could accomplish my vision. I figured it out along the way—and came face-to-face with my aging self. I like what happens when I look through the grid, like peering into and past a wire mesh, chain link or even slatted fence. It forms a scrim for the scene behind—making instant units, providing instant analysis, and in a way, making an instant quilt. Intersecting lines at right angles—the grid conjures youthful memories of wearing wool plaid clothes, my mother teaching me how to sew, years of working with textiles as an art medium, and my more recent fascination with wire fences. I walk and I make art. These two joyous driving forces in my life have entwined to become a single practice. I walk down the streets and alleys of nearby neighborhoods in Dallas, I walk at White Rock Lake, I walk wherever I teach, and I walk on vacation. The scenery doesn’t have to be spectacular, although it often is. In the past year I made it a goal to walk down every alley in Little Forest Hills, the wonderful neighborhood adjacent to ours. The alley fences are splendid in spontaneous design. I am partial this “other” view, the backside of things, the less perfect and somewhat run-down. It’s the side we don’t often present to the public, where people store their extras and pile their refuse. I carry my camera wherever I go, noticing, composing, recording, collecting. Many of these ideas are presented here in this work. The work evolved as I walked. I dye silk, cotton, and other natural fibers using a variety of techniques with MX fiber reactive dyes. These include immersion dyeing, dye-painting, block printing, and monoprinting. I call this “expressive” dye-painting, giving credit to the abstract expressionist painters that influenced my approach to working with dyes. Some works are further layered with drawing, painting and monoprinting with metallic and opaque fabric paints. I also collect vintage, retro, and recent textiles that I recycle in my work. These are the “found” fabrics referred to in the description. I am always on the lookout for the perfect 1980’s silk dress or blouse. They have stories to tell in themselves, give a nod to tradition, and provide the works with a time and culture stamp. 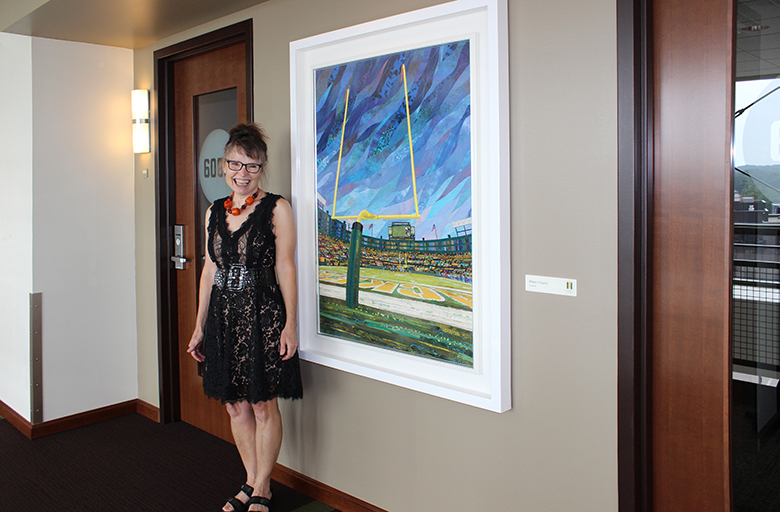 In 2016 Sue Benner was contacted by The Green Bay Packers Organization, whose art collection, is curated by Sports and the Arts (SATA), to produce 2 pieces for their "Walls of Lambeau" Field collection. 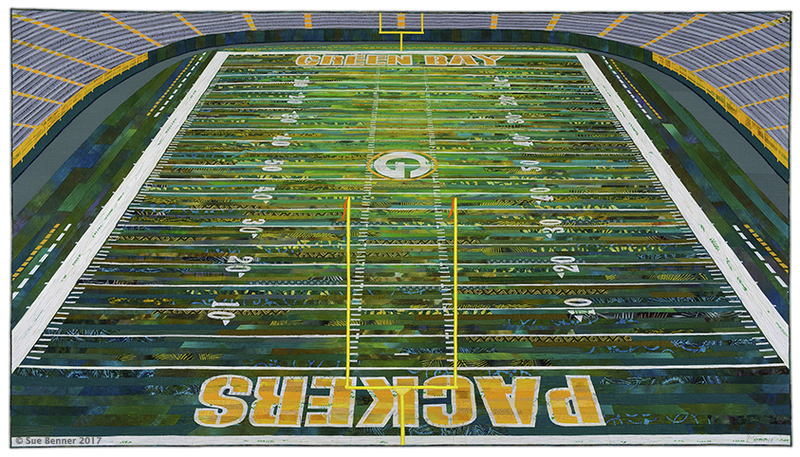 This episode features works completed by artists who have direct Wisconsin ties or an affinity for the green & gold. 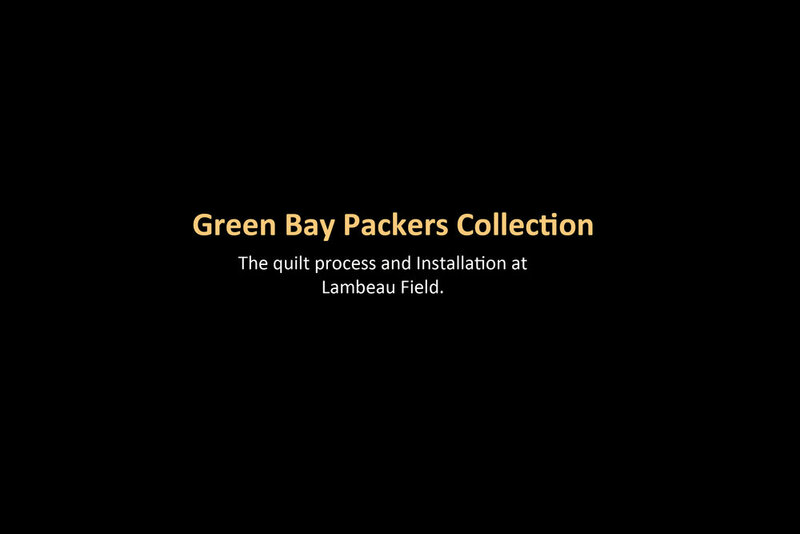 That story of the commissioning of Home of Your Packers and Where It Counts was featured in an episode of Packers Life on February 5, 2018. The collection is featured in a background videos on each artist and the video on Sue Benner, including her process and studio. Learn more about Sue's materials and process. We are here at this beautiful green field, Lambeau Field, the Home of Your Packers. The stage is set; everything is perfect and ready to go. The solid geometry and distinctive markings of the field speak of what is to come. The design of this game makes itself known in this structure. It is a challenge of yards: some gained, others lost, and the goal ultimately won. Lambeau Field has the sky for a ceiling and the weather as a player in the game. The goalposts in this dramatic perspective view, reach up into the blueness, issuing a challenge to any team that plays here. The fact that the Packers’ historic stadium continues to be open to the seasons, in Green Bay, Wisconsin, is an act of bravery. The Packers invite the weather in and stand up to it. It is part of their legend and strength. 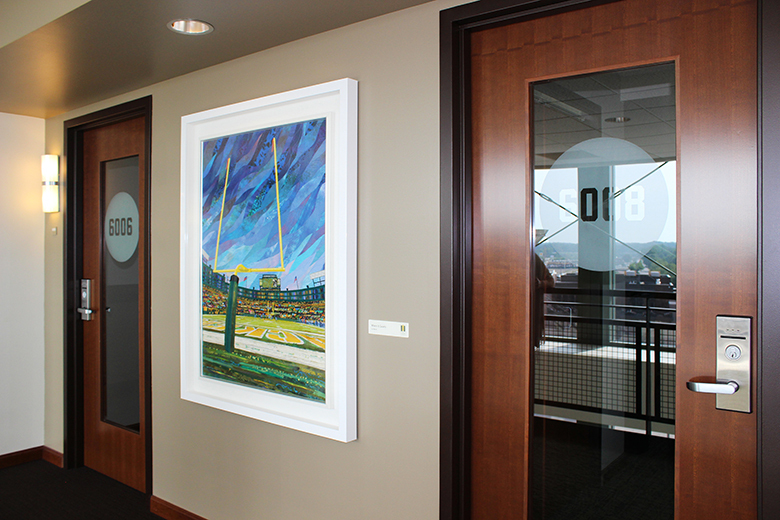 BNSF Railway commissioned this work for their collection of landscape art of the Southwest. Palo Duro Canyon is the second largest canyon system in the United States and is located near Amarillo, Texas. While my goal is to depict a specific place, I also intend for my landscape work to be deeply rooted in the material. I compose with fabric not only because of its physical aspects of color and texture, but also for its emotional, humorous, and ironic qualities. Sue Benner was guest artist in the Medical Humanities Department at Baylor University in Waco, Texas, during the spring semester of 2014. The class, Visual Arts and Healing, was created to give future healthcare professionals an insight into how art can enhance their medical and scientific training. As a cornerstone of the class, the students were required to design and execute a service learning project for a nonprofit agency. Course director, Linda Bostwick, BSN, MN, FNP, asked Sue Benner, MA, a textile artist from Dallas, Texas, to work along with two members of the Baylor art faculty, Mary Ruth Smith, MFA, PhD, and Leah Force, BFA, MFA, to facilitate the making of a work of art to enrich the environment of the Avance Center in East Waco. The Avance Parent-Child Education Program’s mission is to strengthen communities through parent education in child development, literacy, and school readiness. The healthcare students enrolled in the course visited the Center to gather information about the space and program, and then participated in a brainstorming session with Benner to develop a theme for the quilt. The students chose “serape” as the unifying visual idea because of its dynamic colors, graphic stripes, and link to the Hispanic community that Avance has traditionally served. The students felt strongly that the quilt should have an education purpose as well, so they chose to include letters of the alphabet. Each student designed a quilt square that included a single letter on a striped ground. Benner guided them in the construction, design, and machine quilting of the squares, while Smith and Force prepared many of the materials and instructed them in hand stitching and embroidery. The students were required to complete at least one letter square, some contributing two. 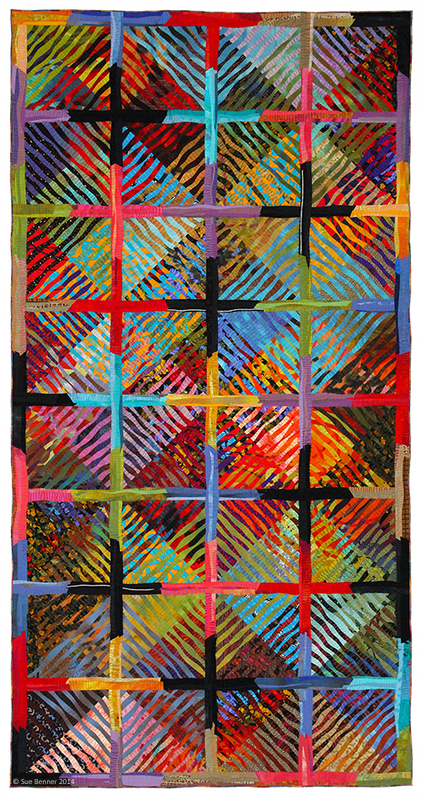 Benner took the quilted squares back to her studio, added decorative machine stitching, arranged and assembled the squares. The final piece, THE AVANCE LETTER QUILT, measures 31” x 92”, is composed of collaged silks and cottons, machine quilted and hand embellished. This project allowed students to explore how art affects an environment and gave them a concrete experience of working with their hands. The curriculum also emphasized visual analysis, attention to detail, collaborative work, aspects of art therapy, and the development of fine motor skills and its application in their future medical careers. The students were surprised to discover the therapeutic effects of making art while using a needle and thread. Long before Mondrian’s Composition with Grid, quilters were making glorious geometric abstractions by sewing together pieces of cloth. It’s hard to imagine that pioneers in Abstract Art could have failed to notice how analogous was the quilt form, for already by the late 1800’s, an unknown quilter from Lancaster County, Pennsylvania, had hand-stitched a violet square inside a blue square inside a brown square. The resulting Center Square Amish quilt is as elegant as an Albers and as expressive as a Klee. Amish quilts can be seen as the prophets of the Modernist use of color and form as subject. For this exhibition at the Museum of Geometric and MADI Art, I am addressing the nonobjective geometric abstraction inherent to quilts and the contemporary practice of this art form. I sought out works from American artists working in a style that most directly reflects the MADI aesthetic: geometric quilts with bold shapes and striking colors. I have included two works of mine that evolved from geometry as an organizing principle, Watchful Eye XII and Wearing Plaid 2. I have been working in the quilt medium for over thirty years and experimented with widely ranging forms and imagery. Geometric abstraction remains the place where my mind can play and hands can find joy in placing one fabric next to another. It is the purest form of my expression. There are many things to say about the history of quilts and the (mostly) women who made them: how great beauty and utility was made from bits and pieces of fabrics; how inventive design was born of limited resources; how they covered beds and provided warmth; or how they created connections in communities. We can debate about whether the makers of quilts from long ago had any recognition of their artistic intent, but we cannot deny their instinct for composition and invention. How can you sew two fabrics together, then three, four, a thousand and not know you are creating something of beauty and importance? 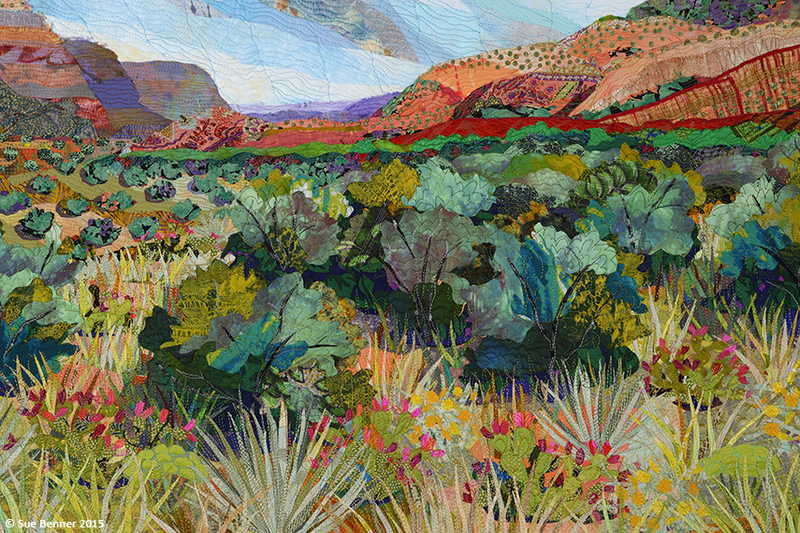 Now, working as artists, we self-consciously make our quilts, trying to live up to the gifts of our tradition, and pushing ourselves into new territory and geometry. This is a work of creation and evolution, of reflection and collaboration. The quilt began with a charge for the Centennial Celebration Committee to create an artwork to hang in the sanctuary to commemorate 100 years of church history. I commenced with a desire to incorporate various levels of meaning into the structure of the artwork: a grid of one hundred squares, curved outlines suggesting a chalice and flame, and symbolic representations of Unitarian Universalist principles. I wanted the work to invite interpretation, contemplation, and discovery. 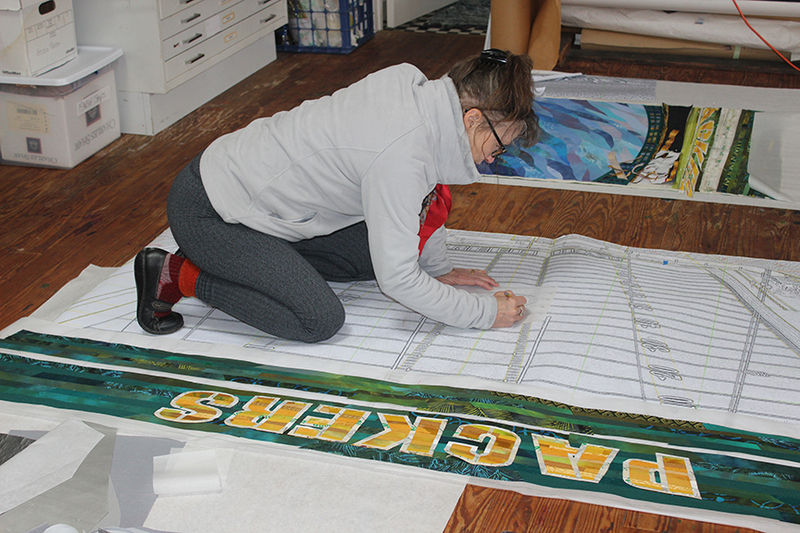 The artwork is essentially four silk quilts, together making a ninety-six inch square. Each of the four equal sections has an identical chalice and flame design. The rim of a chalice is suggested as a gentle curve, with tongue-like flames rising out of this arc. By rotating the orientation of each of the four sections ninety degrees, another design is made—a swirling form, a whirlpool, a galaxy. At the center where the four sections meet is space for imagining the mystery. Over the whole work there is a scattering of confetti to celebrate 100 years of community in liberal religion. Alternatively, the work can be hung as four separate works across the front of the sanctuary, or in pairs at the sides. Because of this versatility, and a rotating schedule that the church and I developed for display, the view of the art is refreshed from year to year. The Brain Quilt was originally commissioned in 1981 by Medical Illustration Services (MIS), a division of the Department of Biomedical Communications at the University of Texas Southwestern Medical and Graduate School. In 2013, Lewis Calver, Director of Biomedical Communications, arranged for the Brain Quilt to be given to the Department of Neurological Surgery, Hunt Batjer, MD, Chairman. In 2014, the new owners asked me to review and refurbish the work. I removed the commercially-dyed velvet outer border and replaced it with custom-dyed cotton velveteen. I also added quilting in the inner borders (sashing) and in the new outer border. The Brain Quilt was reframed in June of 2015 and installed in the conference room of the Department of Neurological Surgery. The Brain Quilt illustrates nine horizontal sections of the human brain with emphasis on the visual and auditory pathways.